Marshall University Year-End GigaPan Celebration! The June Harless Center for Rural Educational Research and Development, part of Marshall University's College of Education and Human Services in Huntington, West Virginia held a year-end GigaPan celebration Monday, May 23. The GigaPan camera is a simple robotic platform for capturing very high-resolution panoramic images with a standard digital camera. These images are then downloaded onto a computer, where the software stitches the pictures together to create a single navigable image. Projects from the first of a two-year grant funded by the Claude Worthington Benedum Foundation were on display. The grant also enabled teachers to integrate innovative technology into existing curriculum. In addition, the project supported local and regional students to take GigaPan panoramic images of their communities and activities and share them with peers across the world. Schools showcasing projects were from Marshall University Professional Development Partnership Schools and include Huntington High, Kellogg and Ceredo Elementaries, Vinson Middle, Cherry River Elementary in Nicholas County and Beverly Elementary in Randolph County. Kelluwen is a project aimed to develop didactic experiences involving social web tools in schools under poverty in southern Chile. We are making pilots, twice a year, involving several schools from different cities in southern Chile. Now we are in the middle of our third pilot with a total of 31 didactic experiences (31 different classrooms) in 12 different schools (most located in Valdivia). Some of these classrooms are running special instructional designs using GigaPan Edu equipment and site. "Fotografiando y construyendo nuestros espacios geográficos y entorno" (Taking photos and building our geographic space and environment) in which groups of students of different classrooms take panoramas of their own locations. "Te cuento mi cuento" (I tell you a Tale), in which, students from different schools play roles of a story read and represent them in a sort of static theater. We hope our classrooms are taking gigapans and commenting them in the next weeks, so take a look if you want. Unfortunately, all project descriptions and comments are only in spanish! I want to mention that training sessions were specially tiring. Some of the teachers needs quite well and precise instructions and I realize that it would be necessary to split training program into two sessions: 1) set up equipment (camera and robot) and taking panoramas, 2) stitching, uploading and linking panoramas to the educational site. We have an specially trained assistant per teacher, but still we want to give schools teachers the opportunity of using the equipment (some of them showed special interest and we expect they go further with it). Also I wrote a guide (thank you Clara for base material) in spanish. I include it below. I am a teacher in an elementary/middle school in the Diocese of Pittsburgh and I learned about the GigaPan at TRETC, an educational technology conference two years ago where Dror Yaron introduced this robotic device at one of the sessions. After seeing what the GigaPan could do, my mind was spinning faster than the 360 feature of the GigaPan itself, and I was recording mental snapshots in my mind about how I could use this incredible technological wonder at my school. I wanted a GigaPan, but our school had other needs for our budget. I didn’t give up hope. I mentioned my interest to a parent from our PTG group after our mini-curriculum night at school. About a week later, his son delivered a GigaPan Beta to my classroom! This was such a surprise and I was so excited and thankful. Now, I could start “stitching” my ideas together to create our school GigaPan project. I had collaborated with our local Best Buy through a Best Buy Teach Award a couple of years ago, so I contacted the store to see if they had a compatible camera. Best Buy generously donated one along with a 4GB memory card! The school purchased the batteries with a charger and we already had a tripod and computer. So, we were ready to start GigaPanning! I have a small Audio Visual team of middle school students at school and we learned how to set up the camera by watching Dr. Illah Nourbakhsh’s tutorials on YouTube. The students learned so much and we got right to work and photographed our “Grand Canyon” bookshelves - similar to the bookshelf model used in Dr. Nourbakhsh’s tutorials. We experimented with more GigaPanning throughout the year and learned a lot by trail and error. I took advantage of the opportunity to attend a hands-on GigaPan training at CMU on April 20, 2011. Tom, a seventh grade student who helps to train other students using the GigaPan, also attended with his mother. This three hour session let by Clara Phillips was a great opportunity to review what we had been doing, get additional tips and tricks, share our successes with other GigaPanners, and ask questions. Clara took her time demonstrating everything from setting up the camera and tripod to stitching and uploading the images to the GigaPan site. She explained each step of the how to share GigaPans, take shapshots, benefits of tagging your photos, and placing them in Google Earth. We also had the opportunity to take some GigaPans on site and share them. The workshop was very well organized and it was a pleasure to be part of this class. I also enjoyed meeting all the other attendees. An added bonus to attending this workshop was meeting “Tank” the roboceptionist who directed us to the class when we entered the Newell-Simon Hall. Thank you to CREATE Lab for all that you do for teachers, students, and the community! There is a new version of the GigaPan Upload software available at http://gigapan.org (click on the "Download the Uploader" link there). As always, GigaPan Upload is free. There are Mac and Windows versions, numbered 1.1.1551 and 1.1.1552, respectively. GigaPan Stitch takes multiple overlapping images, typically tens of megapixels each, aligns them, blends them, saves them in gigapan quadtree format on disk, and can upload the quadtree to gigapan.org for sharing and web viewing. GigaPan Upload takes an image in a single file, typically hundreds to thousands of megapixels, and dices it up to create a quadtree that it uploads to gigapan.org. The latter is useful if you've stitched an image and chose to edit it with software such as Photoshop, or if you stitched using something other than GigaPan Stitch. * Upload can now reliably upload images of practically unlimited size (the old version failed at around 100 gigapixels). The world's largest digital image (Shanghai, 272 gigapixels, http://gigapan.org/gigapans/66626/) was uploaded with this software. * Upload can now read and upload Photoshop PSB (aka Large Document Format) and PSD files, even multilayer ones. Previously it was necessary to convert images to TIFF or RAW format in Photoshop, before running Upload. Note that if your pictures have 8 bits per channel, you can conserve disk space when saving your PSB files by declining the "maximize compatibility" option, since Upload knows how to composite the layers itself. Note that PSD files are 30,000 pixels in width or height, maximum; PSB files are 300,000 pixels in width or height, max; TIFF files are 4 gigabytes, max (although Upload on Windows cannot currently handle TIFFs larger than 2 gigabytes); and RAW files have essentially unlimited size. * Upload now gives you an estimated completion time, as it uploads, tells you upload throughput so far in megabits per second, and informs you of any interruptions to communication with the server (if your computer went to sleep, you lost your network connection, or our server became overloaded). * Upload now retries forever, so if you begin an upload with your computer in one location, lose your connection, and then reconnect to the network later, potentially at another location, if Upload is still running, it should continue from the point where communication was interrupted. * Upload now has an experimental option for resuming upload that is useful if you're doing uploads that take multiple days, and upload happens to fail in the middle (e.g. because your computer reboots). Ask me if you want to know more about this (ph@cs.cmu.edu). * It is the same speed as the old Upload. I plan to improve upload speed in a future version. LARGE scale prints (4 feet high and up to 17 feet wide) of these images will be unveiled on November 11 at Carnegie Museum of Natural History, in conjunction with the opening of the Fine International Conference on Gigapixel Imaging for Science. The prints will be on display to the public at the museum through the end of the year. On Thursday, September 23rd (weather permitting), a team of talented gigapanners will be capturing a stupendous photographic portrait of Pittsburgh. You are invited to take part. 1. Check the first Pittsburgh Gigapanorama at www.gigapan.org/gigapans/47373/ Zoom in and find a familiar spot in the landscape where you’ll be seen. The closer to the Tower the better, but any place that can be seen in the first image should also be visible in the second. 2. Let us know who you are and where you'll be by visiting the Pittsburgh Gigapanorama FaceBook page or following the STUDIO for Creative Inquiry on twitter @CreativeInquiry. Please provide an e-dress and/or cell phone number so we communicate with you before, during, and after the shoot. D. 2:00 – 3:00 - North Shore, PNC Park, and points north. Plan to be in your position before shooting for your section starts and be ready to follow our Twitter feed on-site so you’ll know when we actually start taking pictures in your direction. While you can just stand in place and smile, we encourage creativity. Wear a costume or colorful clothing; hold a sign or banner, anything to help you stand out from the landscape. Also, bring a cell phone that day so we can communicate when we are shooting images in your direction. Also have someone snap a picture of your display that you can send us. Since the Pirates will be playing in PNC Park at 12:35, you can also be in the picture simply by going to the game and sitting on the right or left sides of the field (no outfield seats). We hope to release the completed image online in late October, when you will be able to visit the image, find and take a snapshot of your participation. We’ll also make a large (4 feet x 25 feet) print of the image and include it as part of our gigapanorama exhibit "New Perspectives of Pittsburgh" which will be in the Photo Forum Gallery in the upper lobby of the U. S. Steel Tower from October 11 through November 19, 2010. Details to follow. So join the fun and please also share this information with your Pittsburgh networks and contacts so others can participate. 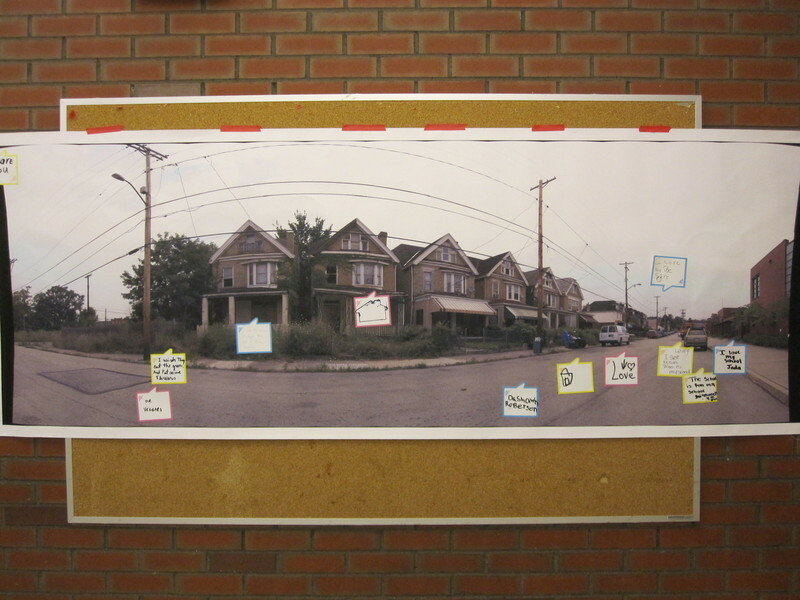 The Pittsburgh Gigapanorama project was initiated by David Bear at CMU’s STUDIO for Creative Inquiry and has received support from the Heinz Endowments and Sprout Fund.